Couldn't Get Santa Cruz Out of My Mind! 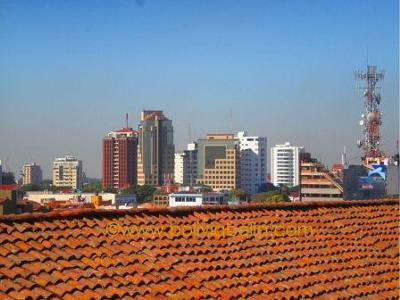 Before I arrived in Santa Cruz de la Sierra, Bolivia, almost a week ago, I lived in Ciudad Del Este, Paraguay, for most of two years. I had been in Santa Cruz for a few days during that time and did not realize then that I had fallen in love with the city, the country and the people. It was very subtle. But several months later it suddenly struck me! I could not get Bolivia out of my mind. So, about a month ago, influenced by a few factors and indicators that I should return to the city of my birth, I returned to Santa Cruz determined that this is where I will stay. I liked Ciudad Del Este, thanks in huge part to my ESL students and the many friends I made there, but I absolutely love Santa Cruz. The differences between these two cities is immediately noticeable. I'll give just a few examples. Santa Cruz is a much, much more organized city than CDE. For a city that is about 6 times larger, with a population of about 1.8 million, Santa Cruz's traffic is nowhere near as wild as it is in CDE. Modern traffic lights, an apparently well-thought out city thoroughfare plan, and a much more positive driving attitude, make getting from one point to another, relatively quick and simple. There is remarkably less noise and air pollution from traffic, here. Public transportation consists of mostly well-maintained, and newer, taxis and micro-buses. Pedestrians wanting to cross a street are often given the right-of-way - something that is totally unheard of in CDE. As for motorcycles - there are very, very few. My bias notwithstanding, Santa Cruz is also a much more scenic, cleaner, generally more honest, and certainly more friendly city. Residential areas are well laid-out and, stores, businesses, and restaurants are very easy to find, simply because they are not hidden as they are in CDE. People in Santa Cruz in general, generate much less noise, with the exception of very annoying car alarms that are popular now. Otherwise, for a city of its size, it is amazingly quiet! Not without life, just quiet. For people like myself that enjoy walking a lot, another difference here is that there are no hills to climb or descend like there are in CDE. A major advantage!! As for the people here, the Bolivian women and men are beautiful and friendly, as they are in Paraguay, and yet, and this is only partially biased, the women here seem more beautiful than there. These are just a few of the major differences I have noticed. As I learn more about Santa Cruz and Bolivia, not necessarily in comparison to my former home, I will try to share that information and hopefully some photography as well. I hope some of this information is useful and if Bolivia seems to beckon you, perhaps you too will heed the call! Good luck and welcome! Comments for Couldn't Get Santa Cruz Out of My Mind! Interesting comment on Santa Cruz Jacobo! We actually still have many many years in Paraguay until we can become equal to a devoloped country, hope we can make it someday! I find bolivian girls to be beautiful just like here,since beauty is in the eye of the beholder. Anyway, I hope you are taking the best out of life there. We won't forget you, and all the good things you tought us, about english, finance and uplifting chat. I AM GLAD THAT MANY PEOPLE LOVES SANTA CRUZ, YOU GUYS DIDN'T MENTION ABOUT THE FOOD SO YUMMMY. ANYWAY, IF ANYBODY NEEDS A HOUSE TO RENT?? I CAN HELP YOU WITH IT BECAUSE I HAVE ONE, IN A BIG LAND WITH TREE FRUITS AND LOTS OF SPACE. Thanks for sharing this. It's the first time I've ever heard someone say Santa Cruz is organized and quiet! LOL. This is a great point of view, Jacobo. It's easy to see the negative aspects of a place. What helps us see the positive is, more often than not, the attitude we choose to have. One of the things I like best about Santa Cruz is the contrast between old and new. I've shared a photo (above). Thanks for sharing your story!! !